Neighboring Stanford and Palo Alto, Menlo Park is one of the most affluent and educated towns in the world. Not surprisingly, the streets are filled with splendid architecture. William Duff Architect (WDA) is among them, with a residence that certainly does not disappoint. Built on a flat site, the house continually engages the eye with shifting perspectives. WDA integrated high-end modern design and a commitment to green building for the Menlo Park house. It makes use of an existing foundation and innovative landscape. Cor-Ten steel, stained concrete mixed with fly ash, and Finnish birch plywood veneer are counterbalanced with green flourishes. For example, the house uses radiant floors, solar hot water, photovoltaic power and passive ventilation – with the help of several NanaWall installations. 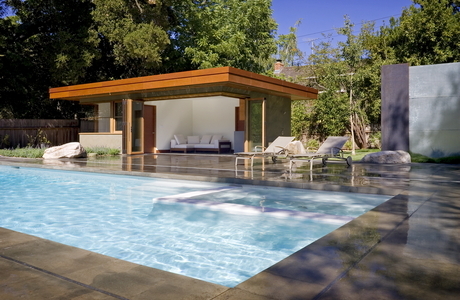 WDA installed 90-degree, cornerless NanaWall units in two locations: the open-spaced living room/dining spaces, and the pool house. A third system was installed in the pool house bathroom. "NanaWall doors function as 'opening walls' that define the living spaces without fully enclosing them, and establish flow between the different spaces and activities." 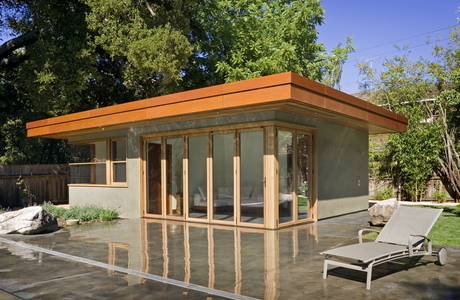 Outside the Menlo Park residence is a study in modernist landscape design. 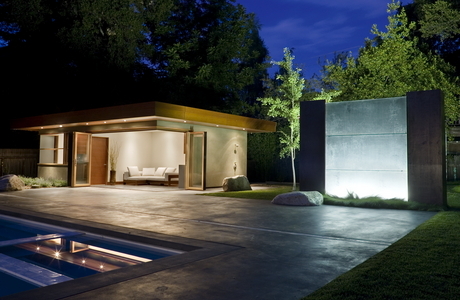 Like the house, the backyard uses stained and polished concrete around the pool, on the planters, and the illuminated sculptural wall. Massive boulders broker the marriage between the modern and the natural that NanaWall symbolizes. For example, one rock is unnaturally anchored on the concrete patio, grass and traditional Zen gravel. The remarkable effect pays homage to disparate cultural aesthetics, and consequently embraces the modern. This refined garden can be enjoyed by the homeowners while making dinner, lounging in the pool house, or swimming in the pool. There’s no separation between outdoor/indoor space, thanks to NanaWalls. WDA used two cornerless units in these spaces that face the backyard, which creates a mind-bending effect of openness and continuity. This standard is mirrored in many of the fixed windows found throughout the house. The optical subtlety is repeated in the lawn, which rises up to one side, bringing the eye up and out of the house. Moreover, the different heights create further movement. 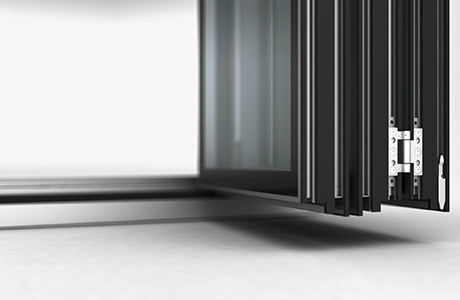 The NanaWall WD66 systems have wood frames, with finishes specified to contrast with the concrete and steel materials. Duff added custom cabinetry in the kitchen, and matched those colors to the wood on the ceiling boards and siding. The bathroom at the back of the pool house remains private despite using the floor-to-ceiling NanaWall openings, thanks to a privacy fence and flourishing bamboo.